This year the Public and Third Sectors category had some really strong entries, with high scores achieved by the top runners. In 2014 it offered up the Overall Winner with British Gas. Could it do so again in 2017? The two top contenders for the trophy were: Lancashire Teaching Hospitals NHS Trust with Ingenica Solutions and Severn Trent Plc. Both were excellent, but there could only be one winner. Procurement within the NHS is constantly under the watchful eye of the Government; every possible means of cutting expenditure is reviewed. It is now mandatory for all hospitals to implement GS1 data standards and inventory management, which will undoubtedly enhance the efficiency of inventory usage in hospitals. At Lancashire Teaching Hospitals NHS Foundation Trust they have made significant progress here by implementing Ingenica Solutions’ inventory management solution, Atticus. The system was initially deployed in the busiest, most challenging and highest spend area of the hospital, the operating theatres, with an aim to provide an organisation-wide view of inventory levels. It has since been rolled out to more than 130 areas, including 25 wards. The judges were certainly impressed with the results: £3 million of balance sheet adjustments recovered through stock visibility; reduced time spent by clinicians undertaking procurement/supply chain activities; reduced wastage, improvements in patient safety, better track and trace capability and reduced overstock in orthopaedic implant stores by £500,000. In fact, they were so impressed that they decided to Highly Commend them. From left to right: Phil Donnelly – supply chain analyst, Severn Trent, Fulya Hinde – DST team manager, Severn Trent, Chris Wand, Head of Supply Chain, Severn Trent, Ema Yasenova, project manager, Severn Trent, Rachel Passey, Supply Chain transformation Lead, Severn Trent, Stuart Thomas, Warehousing manager, Severn Trent, Colwyn Griffiths, Warehouse Operative, Severn Trent, Tomas Molenda, Warehousing team leader, Severn Trent, Jay Barnett-Evans, warehousing team leader, Shelton, Severn Trent, Jason Fletcher, Supply Chain Integration Lead, Severn Trent, Richard Hunt, former Chairman, London Ambulance Service, and host Sara Pascoe. However, the entry from Severn Trent Plc was particularly strong and exhibited everything the judges look for in an outstanding entry. Severn Trent water is a FTSE100 company that delivers critical services to over 4.5 million households and businesses, employs 5,500 people and operates a network of over 46,000km of water pipes, along with 91,000km of sewers. Following an in-depth review of its supply chain it was clear change was required. Some 90 per cent of products were delivered direct from suppliers to operational sites rather than through internal stores. There was a lack of data and inefficiencies had lead to excessive inventory being held in ‘squirrel stores’. There were too many suppliers, poor supplier performance and no established supply chain for critical spares. All in all, there was no proper inventory management and no central supply chain function. 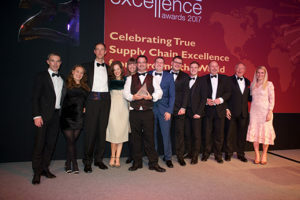 The Judges were simply blown-away by the approach taken by Severn Trent’s management to transform the supply chain, starting with a thorough benchmarking exercise, followed by an extensive list of prioritised objectives including the building of three new RDCs in under six months, the creation of a new internal distribution network to 65 key sites, reduced lead times for operational teams on critical parts by 75 per cent, introduced Self-serve stores using vending machines, implemented bar coding at distribution centres and self-serve stores, streamlined van stock across 1,500 vehicles… the list goes on. This was an outstanding performance with a transformational impact on the business. The award had to go to Severn Trent Plc.